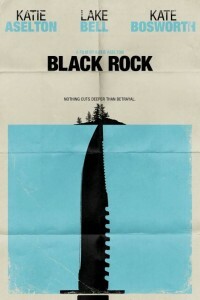 As counter programming to , LD Entertainment, a fledgling mini-major movie studio, is releasing the ultra low budget Black Rock, which features a cast of D-list, at best, actors. Three young women – Sarah (Kate Bosworth), Abby (Katie Aselton) and Lou (Lake Bell) – get together for a private campout at one of the iconic settings of their childhood, an empty island off the coast of Maine, to renew their bond of sisterhood. They quickly learn, though, that the island is anything but empty, when they encounter three recently-returned servicemen, who have come to the island to hunt. A misunderstanding quickly turns to tragedy, and the three women soon find themselves the targets of the hunt. What started as a simple getaway to recall old times is now a race for survival as three ordinary woman must find extraordinary strength in order to beat the odds against violence and the elements.